In the dark confines behind our eyes lies flesh full of mysterious patterns, constituting our hopes, desires, knowledge, and everything else fundamental to who we are. Since at least the time of Hippocrates we have wondered about the nature of this flesh and its functions. 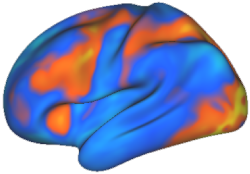 Finally, after thousands of years of wondering we are now able to observe the mysterious patterns of the living brain, with the help of neuroimaging. First, electroencephalography (EEG) showed us that these brain patterns have some relation in time to our behaviors. EEG showed us when things happen in the brain. More recent technologies such as functional magnetic resonance imaging (fMRI) then showed us where things happen in the brain. It has been suggested that true insights into these brain patterns will arise when we can understand the patterns’ complex spatio-temporal nature. Thus, only with sufficient spatial and temporal resolution will we be able to decipher the mechanisms behind the brain patterns, and as a result the mechanisms behind ourselves. Magnetoencephalography (MEG) may help to provide such insight. This method uses superconducting sensors to detect subtle changes in the magnetic fields surrounding the head. These changes reflect the patterns of neural activity as they occur in the brain. Unlike fMRI (and similar methods), MEG can measure neural activity at a very high temporal resolution (>1 kHz). In this respect it is similar to EEG. However, unlike EEG, MEG patterns are not distorted by the skull and scalp, thus providing an unprecedented level of spatio-temporal resolution for observing the neural activity underlying our selves. Despite being around for several decades, new advances in the technology are providing unprecedented abilities to observe brain activity. Of course, the method is not perfect by any means. As always, it is a method complimentary to others, and should be used in conjunction with other noninvasive (and the occasionally invasive, where appropriate) neuroimaging methods. MEG relies on something called a superconducting quantum interference device (SQUID). Many of these SQUIDs are built into a helmet, which is cooled with liquid helium and placed around the head. Extremely small magnetic fields created by neural activity can then be detected with these SQUIDs and recorded to a computer for later analysis. I recently got back from a trip to Finland, where I learned a great deal about MEG. I’m planning to use the method to observe the flow of information among brain regions during cognitive control tasks involving decision making, learning, and memory. I’m sure news of my work in this area will eventually make it onto this website.